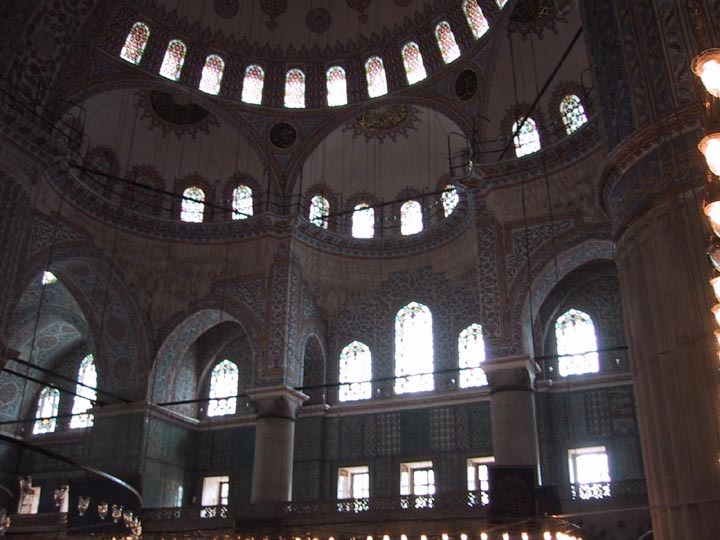 The Blue Mosque is named for the blue Iznik tiles that cover its interior. 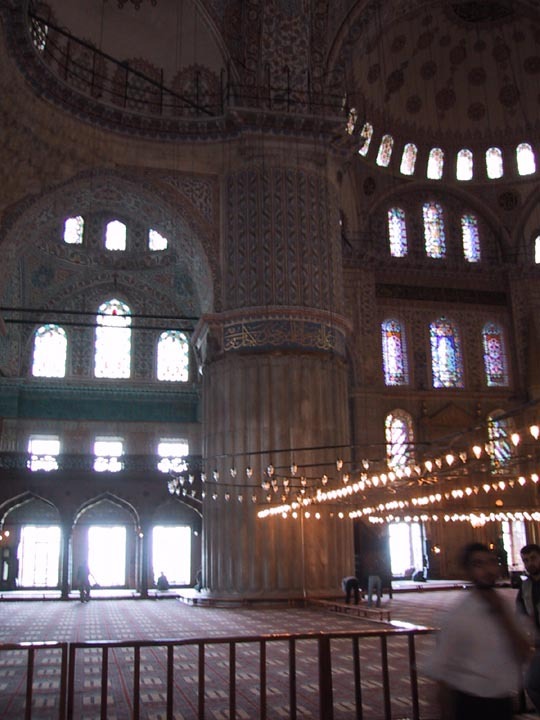 It is one of the most widely recognized religious buildings in the world. Dramatic by day, it is beautifully lit at night, occasionally putting on light shows and firework displays. It was commissioned by Sultan Ahmet I in the early 17th century. 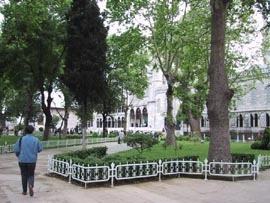 Avoiding crowds, we entered through the western gate into the grounds of the mosque, notice the masses of tourists near the entrance to the courtyard. Looking to the right of the previous picture, shows the quieter western side of the mosque, where locals enter and exit. 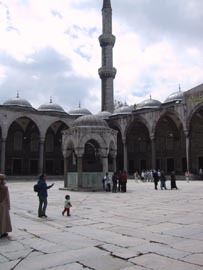 Every mosque has a courtyard, in the center of the courtyard is a fountain that is usually used for ritual ablutions. The entrance way for tourists took us across the courtyard, under the domed ceilings of its perimeter - this is a view of the interior of one of the domes. 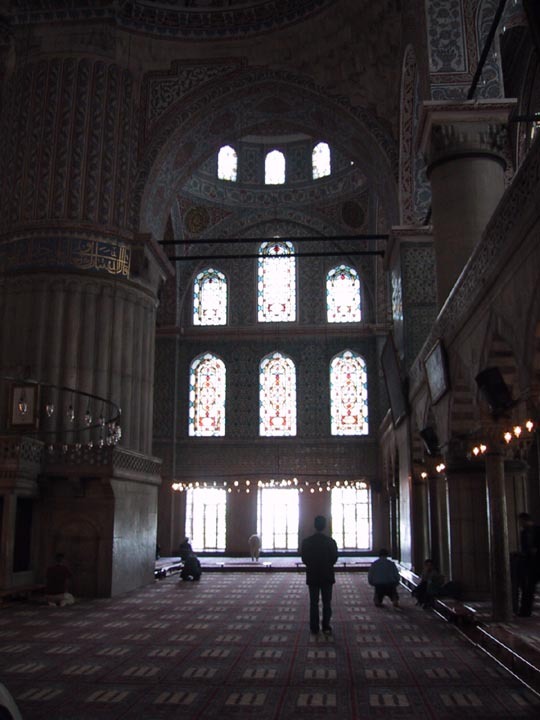 There's no admission fee to visit a mosque, although its considered good form to make a donation to a mosque official after your visit - in fact, the Blue Mosque had a little booth set up at the exit to accept donations and provide receipts. There are separate entrances for worshippers and visitors - the visitors entrance is off one side of the mosque, a bit farther to walk, and has many signs providing instructions on the appropriate dress and behaviour instead the mosque - it was embarrassing to realize that the majority of tourists not only hadn't researched the proper decorum for entering a mosque, but wouldn't read the signs either. 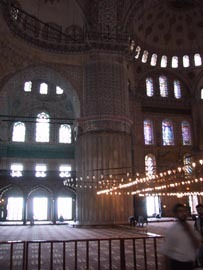 Just past the visitors entrance, looking into the prayer hall, this is about a third of the total size of the prayer hall. 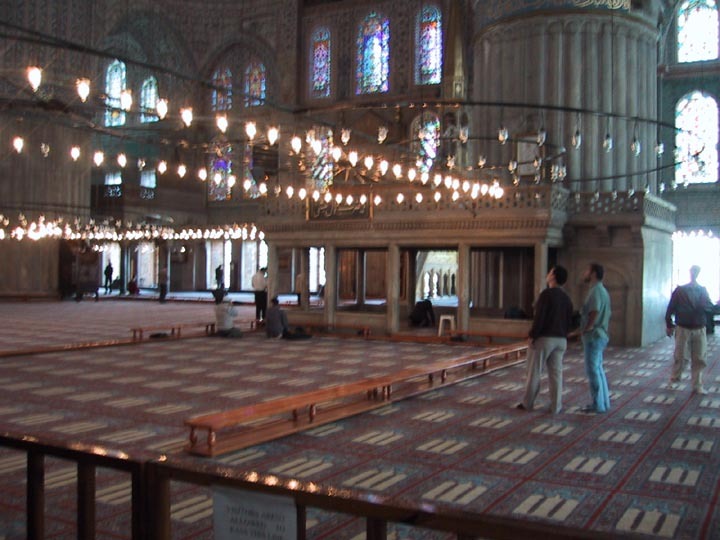 Not visible is the barrier stopping visitors from entering any further - the people beyond the barrier are the faithful, who kneel in prayer and repeatedly press their head to the floor. Looking up and to the left of the previous picture, the high dome of the Blue Mosque - remarkably similar to the Haghia Sophia in its design of a vast, open chamber. 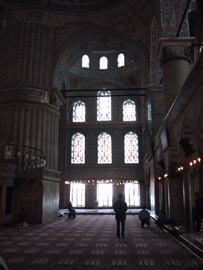 There are over 250 windows letting light into the prayer room. 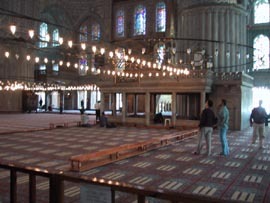 Moving across the prayer chamber, this picture shows the centre portion of the room. 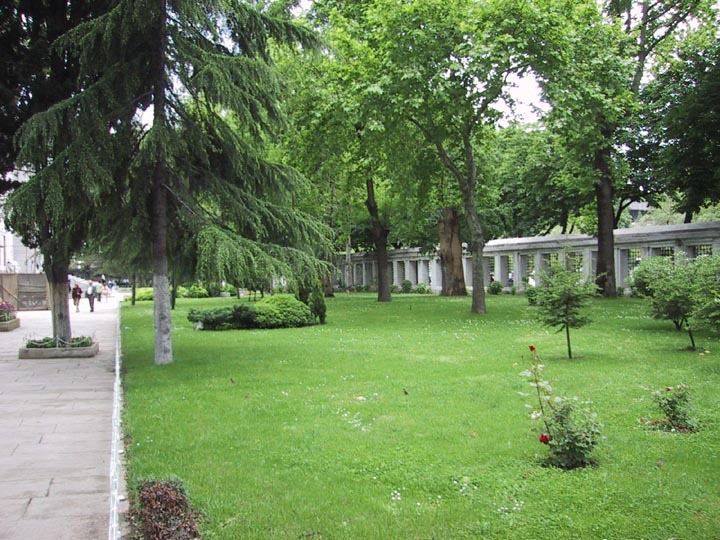 Behind the barrier are several hundred tourists. 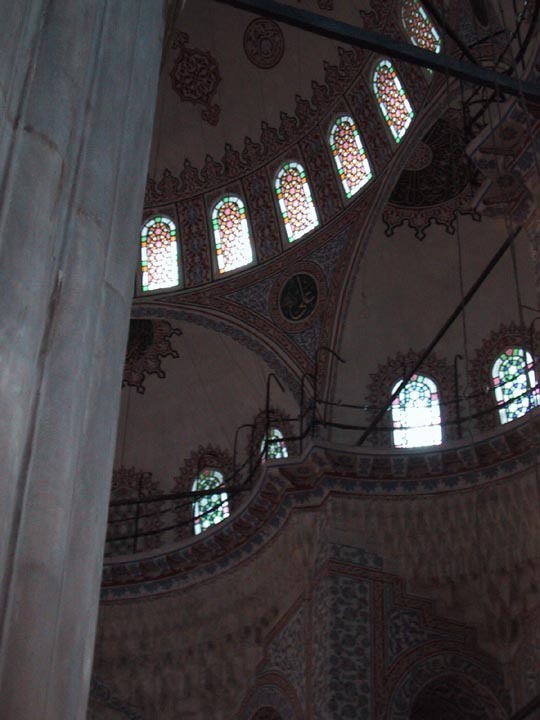 Now on the far side of the prayer chamer, looking upward at the many alcoves, windows and roundels in the prayer room. 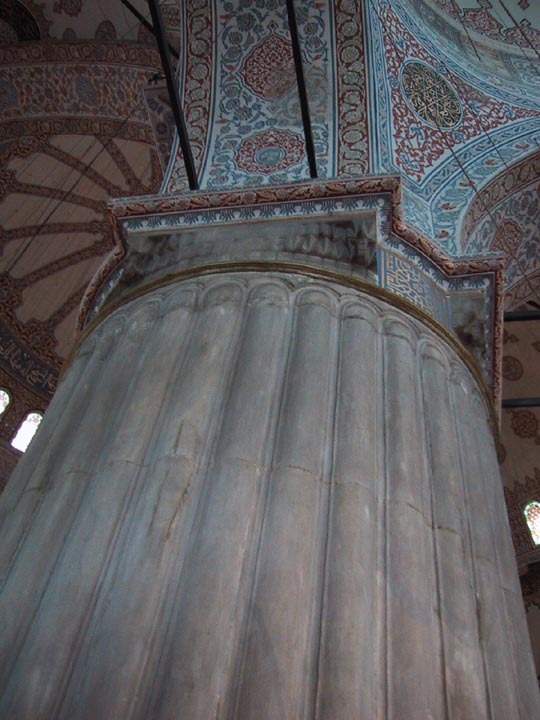 Four massive pillars, like the one pictured here, support the high dome of the Blue Mosque. 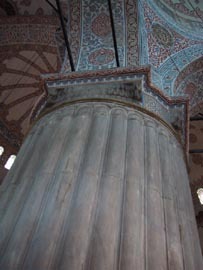 A close up view of the head of one of the massive (over 15 foot diameter) columns. 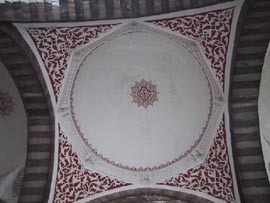 Notice the intricate pattern work of the column head and ceiling. 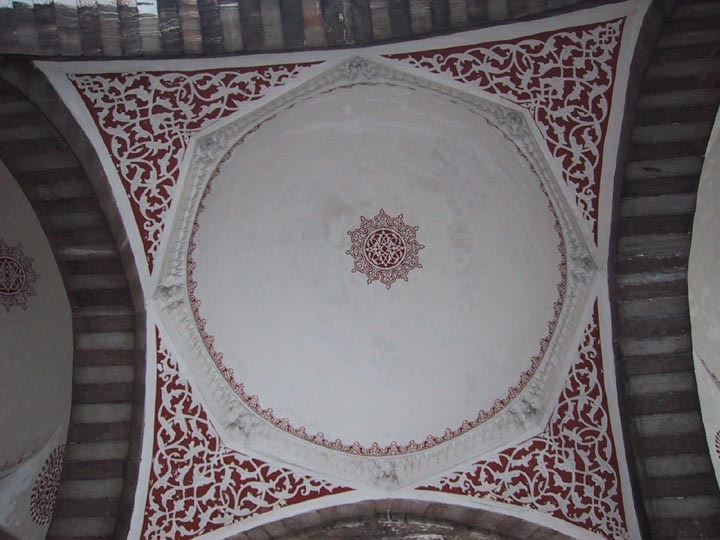 A focus on a roundel in the prayer room, roundels typically have the name of Allah, prophets, martyrs, the sponsors and builders of the mosque on them. 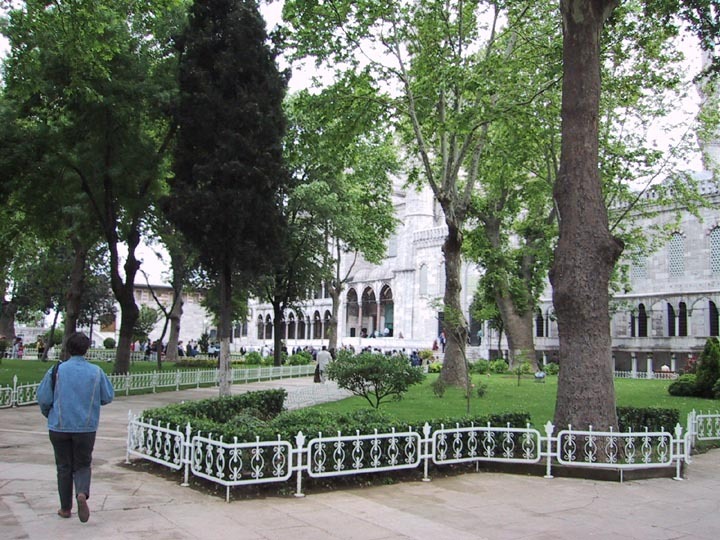 Leaving the Blue Mosque, you can see one of the six minarets that surround the mosque. The Blue Mosque was quite controversial in its day. Most mosques have a single minaret, which was used by the muezzims to call the faithful to prayer (these days its done with loudspeakers, less walking up spiral staircases that way). 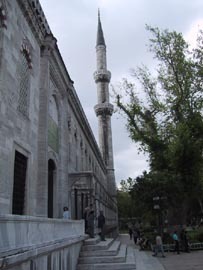 Imperial mosques (those built with funds from the sultan) are allowed more than one minaret - many have two, a few have four (like the Haghia Sophia). 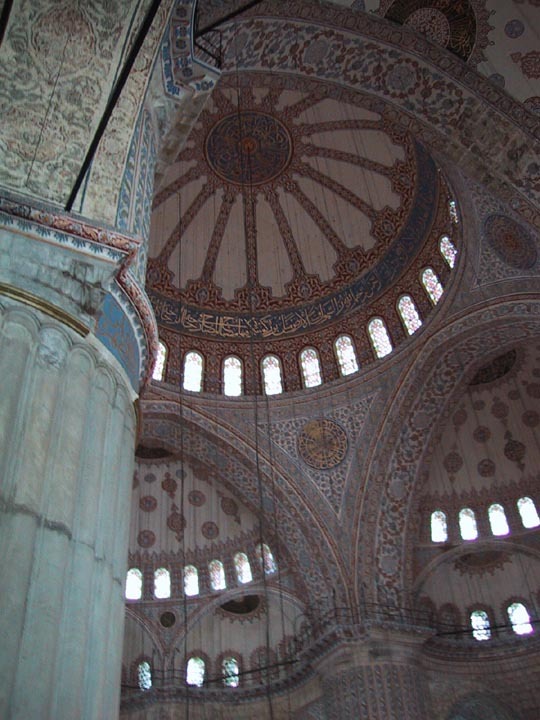 The Blue Mosque has six - and that's one of the things that caused controversy, a belief that the Blue Mosque was trying to rival Mecca. On top of that, the Ottoman empire at the time was in decline, and an expenditure of the magnitude it took to build the Blue Mosque was seen as wasteful at the time.